Imagine living in a cute wooden cottage, that is simple, rustic and surrounded by fields as far as the eye can see. Saligao, with its grand old houses and winding roads, can be mistaken for a regular developed Goan village. But move some 5 minutes away from the main road, and one will see large tracts of land that are still farmed every day for rice & veggies. In one of these farmlands, through a short dirt road are the Saligao Farm Cottages, a green haven in the midst of a tourist belt. Four cute wooden cottages with attached bathroom & plumbing (so relax it is not totally rural) sit right in the middle of lush open fields. So instead of the usual jungle that you will see in most of Goa, this one instead offers you open green vistas. What we really liked is that the owner’s wife visits every day, to plant some veggies and tree saplings in the quite big farm that is part of the property. They are all about sustainable farming and if you’re interested then you can join in and help her. You just might learn a thing or two about getting that veggie garden started at home or even pluck some fresh organic veggies to take home. You could even offer to help out in the surrounding rice paddy fields. When you’re done grab that hot cuppa (or even a warm Brandy) and sit outside, breathing in the clean crisp air. 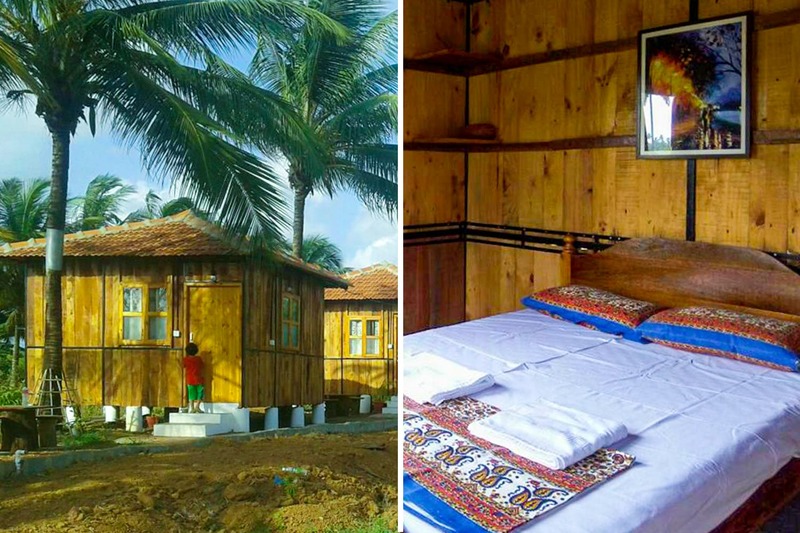 You can book a cottage here for just INR 1500 (for two), which includes a hearty breakfast in the mornings. Just walk around, or rent a bicycle to traverse those mud roads through fields, and you just might forget that you are just 10 minutes away from the party crowd. If you’re looking to do something different then definitely book a stay here. Maybe even gather your gang or just bae, a guitar (the owner also plays some tunes when he visits) and lie under the romantic canopy that the open night sky offers.